A map of The Veluwe (with north to the right), a forest-rich ridge of hills in the province of Gelderland in the Netherlands stretching from Arnhem in the south to Harderwijk in the north. 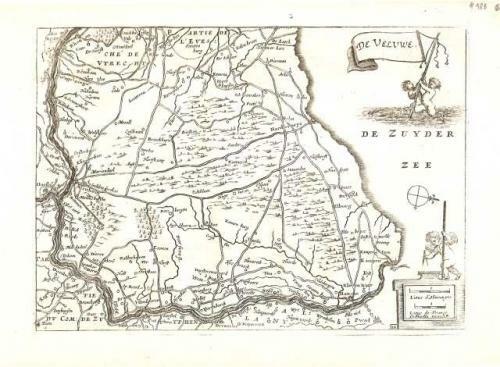 At that time Haderwijk, a member of the Hanseatic League, was situated on the Zuider Zee. Now with the land reclaimation project of the Zuider Zee a hugh island (1500 km sq. ), the province of Flevoland, has separated it from the open sea. The Veluwe features many different landscapes including woodland, heath, some small lakes and Europe's largest sand drifts. The Veluwe is the largest lateral moraine in the Netherlands, stretching 60 km from north to south, and reaching heights of up to 110 meters. The Veluwe was formed by the Saalian glacial during the Pleistocene epoch, some 200,000 years ago. Glaciers some 200 meters thick pushed the sand deposits in the Rhine and Maas Delta sideways, creating the hills which now form most of the Veluwe.